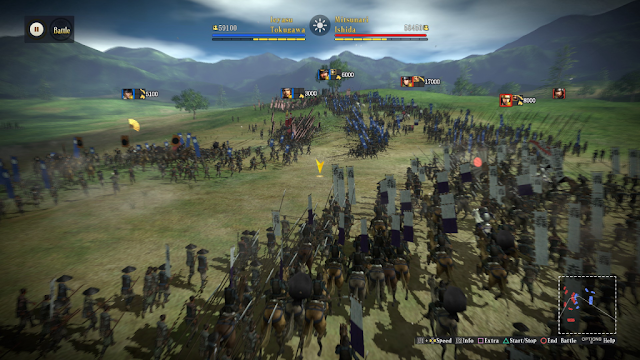 One of Koei Tecmo's lesser-known franchises out here in the west, Nobunaga's Ambition has been a series of serious strategy games that has been plugging around for 35 years now, from way back on the Game Boy, NES, and other primitive game devices, right through to the excellent modern titles on PlayStation 4 and PC. Related reading: Our review of the last Nobunaga's Ambition to be released in English. Koei Tecmo has announced this week that across the franchise, the series has now shipped over 10 million units. That is of course across dozens of different games, but there aren't many serious strategy game franchises that will ever meet or exceed that sales total. It's good news for the future of the series, too. After a long break from localising titles in the series, Koei Tecmo took a risk and released a couple of them over the last few years. Hopefully they continue to sell well enough to continue being localised. BlazBlue: Cross Tag Battle is one of the fighting games that we are most looking forward to here at DDNet, in a very busy year for the genre indeed. Bringing together characters from Persona 4 Arena, RWYB, Under Night In-Birth and BlazBlue itself, it promises to be the dream game for the 2D fighting genre faithful. This new trailer shows of plenty more of the slick, fast, brilliant action, and gives you an idea for how the story sequences will be told. Expect it to be a nonsense story, of course - it is a character crossover, after all - but the art and presentation of it all is just gorgeous. The only downside is that it looks like Risette has been left off the playable roster. Booooooooo, Arc System Works. Boo. This game will release on PlayStation 4, Nintendo Switch and PC. Well, this game's certainly got a brave concept. Brexit talks in Britain have failed, and an extreme far-right government has taken power. The UK is plunged deep into a dystopian nightmare, and you play as a person who has been assigned the task of being a bouncer. Your job is to man the doors of pubs, clubs, and other parties, checking the IDs of revellers, and stopping the place from becoming too unruly. Basically, you're playing Patrick Swayze from Roadhouse, and who hasn't wanted to play that game in the past? In terms of gameplay, it looks like it's a bit of an RPG mixed with Papers, Please. The developers write it up as follows: a time-pressure RPG with a tale of dark humour where every decision matters. Will you join the resistance and fight the regime - or keep your head down and hope that one day this will all be a distant memory? This one's due for release soon on Steam, and consoles later in the year, and expect it to go down about as well as a sack of bricks among a certain sub-section of the community. Oh they will howl so very loudly, which is amusing since they're also the ones that just love to tell anyone who is critical of games they approve of to shut up with the criticism and "censorship". Due for release on PC via Steam "soon," developer Drinkbox has put out a new trailer for the upcoming sequel to indie darling, Guacamelee! 4-Player Local Co-op – Take on enemies as a solo luchador, or with a group of friends!